We had an excellent meeting at Pimlico back in May. Thanks for everyone who came out! 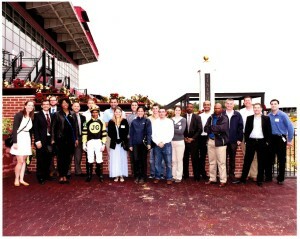 Pimlico Race Course is host to the Preakness Stakes, one of the three legs of the Triple Crown of Thoroughbred Racing. This landmark will be a memorable backdrop to our meeting. Please join your fellow WDCSITE colleagues at Pimlico in Baltimore, MD for a technical presentation, lunch and live horse racing on Thursday, May 21st. PDH credits are anticipated to be offered. 10 lucky attendees will be chosen by raffle to receive a tour of the paddocks and then watch the first annual “ITE Classic” live horse race from the winners circle followed by a photo with the winning jockey. Don’t miss this exciting opportunity! Following the presentation, all attendees are welcome to view the “ITE Classic” and participate in live horse races and networking. Last race starts approximately at 5:45 PM. Please click on the link below to register for the 2015 WDCSITE Technical Meeting at Pimlico. Disclaimer: WDCSITE will not be facilitating or participating in wagering.